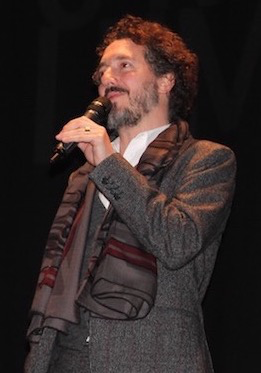 Guillaume Gallienne has had a huge hit with Les Garçons et Guillaume, à table ! In this autobiographic movie, he tells the story of a young man questioning his own sexuality, half-persuaded that he is really a girl, and whose family thinks he is homosexual. The movie, adapted from his own play in which he performed all of the roles, has been a triumph in France, capturing five César awards in 2014 (including the award for the best film and best actor). “If there is one person who can and has to thank his mother, it really is me. Thank you Mum”; Guillaume Gallienne sees this movie as a declaration of affection for to all women, and to his mother in particular. He chose to play her character on screen, and the effect is astonishing – one of the main attractions of the movie. More than a year after its release in France, Les Garçons et Guillaume, à table ! becomes Me, Myself, and Mum in the UK. 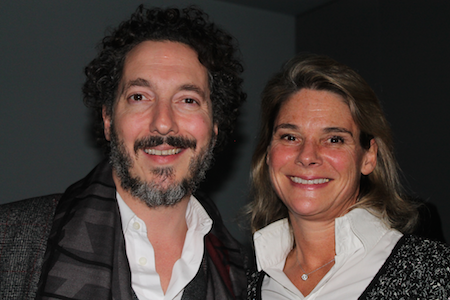 “Finally!” Guillaume Gallienne said he was “very happy to see it released in England.” A few minutes before the London premiere of his film, we met him and, clearly delighted to be speaking about his movie, the actor/director/scriptwriter told us the adventure of Les Garçons et Guillaume, à table ! ...on the couch. How did you come up with the idea of the film Les Garçons et Guillaume, à table ! (Me, Myself and Mum)? The idea came to me when I was at my psychiatrist. I remembered a phrase that my mum used to say: « Les garçons et Guillaume, à table ! ». And right there and then, it all fell into place. The completely off the wall stories I used to tell my friends over dinner were no longer some isolated anecdotes. Suddenly, I realised that this phrase was the key to the puzzle, something which had contributed to the creation of the image of a sexual inclination before a young man has had time to discover it by himself. And at the same time, this story was also telling the birth of an actor. Yes, I wrote my story, quickly and almost instinctively. At first, I remember, I read a first draft to my mother-in-law and to one of her friends. They both went: “phew! » with a big sigh. Their reaction immediately showed me the pitfalls I had to avoid; I had to ensure that anything that could be taken for a vendetta or a big moan should be avoided at all costs. I binned the whole thing and re-wrote my story in the same tone, capturing the same atmosphere in which I used to tell it to my friends over dinner. Did you originally write Les Garçons et Guillaume, à table ! (Me, Myself and Mum) as a play or as a film? To begin with, I wanted to make a film but I knew that I simply did not have the financing… I did not have the necessary budget to make this film about a bourgeois world. Right. Olivier Meyer, director of the Théâtre de l’Ouest Parisien in Boulogne came to me, giving me “carte blanche” in his theatre. At that time, I said to myself “if it is about reading Proust with a harpist playing behind me, no thank you…” But he insisted; “you can do whatever you want, carte blanche to Guillaume Gallienne”. And this title gave me the audacity to just go for it… Let’s start by telling this story on stage. 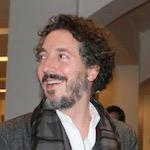 Carte blanche to Guillaume Gallienne? 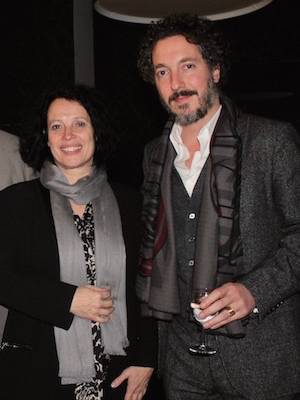 Well, there, this is who Guillaume Gallienne is. Let’s be honest, and go as far as we can. So I told my story to Olivier Meyer, and here I was... signing for twelve dates. Indeed, twelve performances, and a crazy buzz… I went on tour after that, for I can’t remember how many dates. Then I was performing at the Athénée theatre, and I received a Molière… In the meantime, Christelle Graillot from Canal+ had reached me, and I was showing up on TV, with my idea of the “Bonuses” [short parodies]... See, it all happened at the same time! I remember, when I was performing at the Athénée, every night, a film producer was knocking at my dressing room door… And that’s how my play became a movie. In your play, you perform all the characters of Les Garçons et Guillaume, à table ! Wasn’t it too hard to “lend” the roles to other actors for the movie? No, it was the opposite actually: I was really looking forward to handing out all the roles! The thing is, when I played all the characters, I was not able to “defend” them, I did not have the time. I had to play fifty-two roles in a row, and although I wanted to, I was not able to “dig really deep” for each of them. I did not have the time to show how passive Guillaume was, although this is one of the keys in the story. Since you played all the characters, we assume that you had a very specific idea of what you were expecting from the actors. Were you a demanding director? I am always demanding both as an actor or as a director. I only try not to be too specific; things have to be well prepared, well thought out. And surprisingly enough, for someone who gets mad easily, I only flipped once, in the two months of shooting. Of course, it was not because of an actor. It was because of a stupid thing that was not working, and we had some time constraint. What did you enjoy most: being on stage, being behind or being in front of the camera? I preferred making the movie. In the play, there were some times when I could hear people laughing, and I just wanted to tell them “if you only knew what I had to put up with.” It is not that I wanted to complain, I just wanted to find the true measure. Some people in the audience could feel it, but sometimes they were feeling it too much, and they were thinking that my story was too close, too similar to theirs… I know people got all kind of ideas. We loved the character of your mother in the movie, staggering, omnipresent… Does she look really look like you in real life? Physically, not at all! No, she is very beautiful. But her voice… it is very confusing. Even I got confused when I was acting: on the shoot, I was playing my mother in the morning, and Guillaume in the afternoon. And to keep up the rhythm of the dialogues, we were broadcasting over loudspeakers what I had recorded as my mother in the morning, Three or four times, I really thought I was actually hearing her voice. I had done it the morning before, I knew it was me… But it was incredible. Is it hard to change your voice? Not at all, not for me anyway: I have been practising for fifteen years, I love it! Recently, you lent your voice to the cute little bear Paddington, in the film of the same name. How was this experience? It was so great. I love the movie, I think it is terrific. Very well played, with a delirious casting. It is poetic, funny, and magnificent. It really is a family film, for all generations. Today, you must be in great demand… How do you pick your parts? Well, I am not only choosing a part, I am choosing a project. First, there is the theme, then I look at who the director is, and then which part I will have. But unfortunately, my schedule also has a word to say in it… Between the Comédie Française and the cinema, it just piles up. Today, my priority is the Comédie Française. I am very lucky because I have reached a level where I can ask to postpone some film projects; it is quite awesome to be able to say “if you can wait for me, I will be a part of it”… but it is not always the case. Yes, they are. But that’s how you recognise an artist, right, by the choices he makes. It’s all about connections, whether it is with other people like a director for example, or connections with a part. A few years ago, I may not have taken this acting job or I might have. Things change, what I might have wanted before may not be want I want now”. Do you like “challenging” parts? Well, I don’t see it like that. I am not into this “I’ll show you that I am able to go on and on”… For me, it is more about a connection, almost compassion with a character. If it moves me, if I feel like I want to defend it, then I want the part; I want to live with it for a little while. And I know it is going to be for a while: I get nervous as soon as I say yes to something! Still nervous today, after all these years? Even with your experience? Yes, and it is getting worse and worse… I use to be nervous before premieres, then when I started rehearsing; now, I am nervous as soon as I say yes! I start thinking about loads of things: “What have I got myself into?”, “I am not going to make it”, “How am I supposed to play this? It is way too complex” I completely submerge myself, my imagination, into the character I am supposed to be. And when you immerse yourself into a character, do you manage to lead a “normal” life with you family, your friends? Yes, more or less, I manage to “partition”. Sometimes, I wake up in the middle of the night to “unload” things that I put aside when I came back home from work to play with my son, be with my wife, I compartmentalise, and then, at night, I wake up and it catches up with me. But I think all actors live like this. You speak perfect English. Will we see you again in a film in English, as in Marie-Antoinette? For now, it’s complicated, I don’t have time… When I leave la Comédie Française, yes, it will be with pleasure. I have already been offered to make a film in English but I keep pushing back: I refuse to take on a new film without having directed my second movie. A second film? Are you making it at the moment? I am writing it, and we should start shooting it in the autumn of 2016, so it can be released in 2017. Unfortunately, I don’t have the time right now and I really want to do it well if I am going to do it. Once this is completed, then, we will see about the English one! Do you still have a few friends in the UK? Do you see yourself living here? Looks amazingly original, and unique.